With rising real-estate prices and increasing demand for city living in San Francisco, most people in Silicon Valley aren’t terribly worried about the plight of landlords right now. But for every open house that results in throngs of wannabe-renters on the sidewalk clamoring to submit pages of applications for closet-sized apartments, there’s a landlord who has to weed through the details and pick the right renter. And once they find a renter, the landlord has to actually collect checks. Cozy, a San Francisco-based startup founded in March, plans to announce Thursday that it’s raised $1.5 million in seed funding to standardize the application and rental payment processes for landlords nationwide. The round was led by the Social+Capital Partnership, and included investments from Google Ventures (Kevin Rose was behind the deal), Tim Ferriss, Jason Calacanis and Gary Vaynerchuk. The site, which had been testing its product this year and is now accepting members for its beta product, attacks two key points of interaction between landlord and tenants: the application process and monthly rent payments. The founders hope that standardizing these interactions will benefit both landlord and tenant and provide a digital record for both down the line. Cozy is available nationwide, and so far, has seen the most interest from landlords in the Bay area, Portland, and New York City. The founders have created a shorter, more succinct rental application that asks only what landlords need to know about applicants and tries to eliminate unnecessary or repetitive questions. CEO Gino Zahnd explained in an interview that most rental applications ask far more questions than landlords actually want to know, and provide details best left for the actual lease. Zahnd said that most landlords just want to know if a tenant will pay his rent on time. The other aspect of Cozy’s product helps tenants looking to prove their competency to landlords. Cozy allows landlords using the app to collect and track monthly payments online, and provides renters with digital proof of their reliable payments, something which isn’t reflected in credit reports. 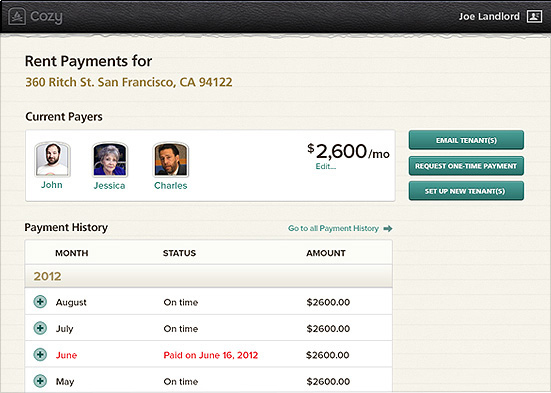 The process allows landlords of multiple buildings or apartments to manage payments without using paper. Cozy is led by Zahnd and John Bragg, who worked together at Kosmix, which is now Walmart Labs, and then at Seabright Studios, a user experience firm. Previously, Zahnd worked for Flickr, Splunk, and Adaptive Path, and Bragg with Capital One. How do you get in a information list when this goes public. Why is pay with these guys easier than paypal? Great timing….now who can afford to invest in and lose their butts in Real Estate? How does Cozy make money? Do they take a percentage of the rent payments? Charge a fee to accept applications and screen tenants? Dan, the beta is free for everyone. We’ll announce pricing when the beta is finished. Thanks for your interest.